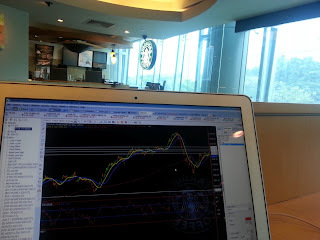 While many people are rushing work on monday morning, I am spending this beautiful monday at Starbuck watching the market. The 3 reason why i love Trading is, I can choose to work anywhere i like, I can choose to work any Time i like and I can choose to work with anyone i like! Cheers. Have a great week ahead! 26 july 2013: I had an interview on 958FM in the afternoon. I mention a few things which is quite correct. 1) Banks and Property stocks is the strongest sector. We should remain holding these sector. 2) US market remain strong for mid and long term, dont need to worry. 3) Penny stocks is overheated, Retail player beware. Now we see, a lot of people are stuck now! Action plan 1: only buy more stocks if STI give us the signal of going higher. If it breaks below 3200, i believe that a alot of fund managers will manage their risk. Cutting down positions. If STI stay within the range mentioned above: STAY COOL!